Dark Places… heard of it? This film was not even on my radar, though it seems like it should have been. A co-worker brought it to my attention a few weeks ago (thanks Nicole! ), and was frustrated because she didn’t know how to see it. Here’s the case of a movie that you would think would register at least a blip. Possibly I just live in a lousy market? Either way, as in the case of Air, this was distributed in simultaneous release. Here’s why I think that this is noteworthy. Dark Places is a character driven mystery based on a 2009 Gillian Flynn novel, of Gone Girl fame, hence the interest of my friend in seeing this movie. One would think that this film would be a bigger deal. So once again: Curiosity x Availability = Review. 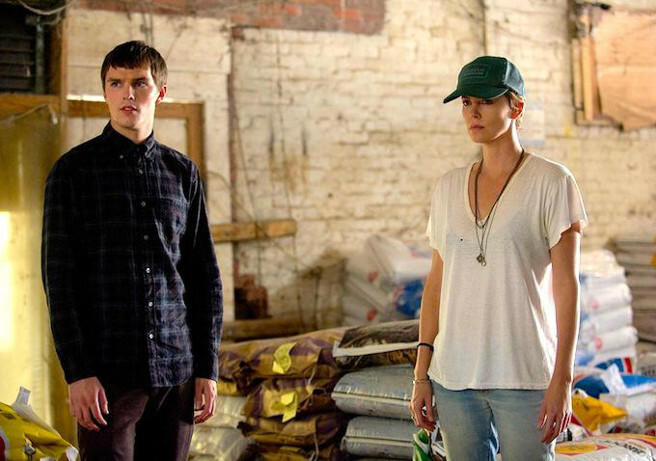 Directed by Gilles Paquet-Brenner, Dark Places centers on Libby Day and her tragic past. Family members were murdered in their Kansas farmhouse when she was a child. A lifetime later, Libby is persuaded to revisit the details of the crime and discovers the mysteries surrounding that fateful night. Paquet-Brenner has helmed some foreign released films, and most notably Sarah’s Key. (I’ve not seen that one, so I plan on it just for some closure to understand if it’s the story or the director.) I have not read this book, so I’m not sure who to blame for things that bothered me. Why does Libby dress like a tough trucker? Why is she so easily persuaded and agree to get untangle the past… now? While we understand the trigger that leads to who the damaged Libby Day has become, why was this particular persona put in place for her? The story gets a little more interesting about midway through and thank goodness for the plot twists that do come, but everything about this seems contrived. Poor Nicholas Hoult gets to do more in the Jaguar commercials than he is allowed to do in this. I felt that the mantle of “character” was very heavy for both Charlize Theron and Chloë Grace Moretz here. When I am distracted by the characters and plot devices, that is a problem for me as the viewer. The point of making a movie is to tell a story… about a person, a place, a circumstance. Success begins with a great script, and the director’s role is to wrangle all of those moving parts to seamlessly and effectively do that. The seams in this film are bumpy and obvious. Don’t go out of your way to see it. Recommendations: For worthy films where a Director is doing this well, watch Eastwood’s Mystic River or David Fincher’s The Girl with the Dragon Tattoo. (In fact, Gone Girl is his, but a bit of a different vein. You will rarely be disappointed by any of Fincher’s!) Both have quirky characters and investigators unraveling intricate plot lines that delve into both present and past. Your Turn: Have you read or seen Dark Places? Please comment and tell me what you think.